Istanbul’s hoteliers, one imagines, have got to be pretty much fed up with all this guff about “East-meets-West.” Sure, it was unbearably exotic to Western eyes a century or two ago, but by now we can all accept that this is one of the world’s great cosmopolitan cities. For all its rich history it’s as modern as anyplace else — it’s the 21st century there, too, after all. As such, it’s a city whose boutique hoteliers have no time for Constantinople kitsch — and as evidence of this new cosmopolitanism, one need look no further than Urban Suites. The name sets the agenda; and while this place is packed with personality, it’s the personality of an extremely accomplished residential designer, one whose keen eye for antique flourishes is paired with a talent for rich textures, from leather to salvaged wood. 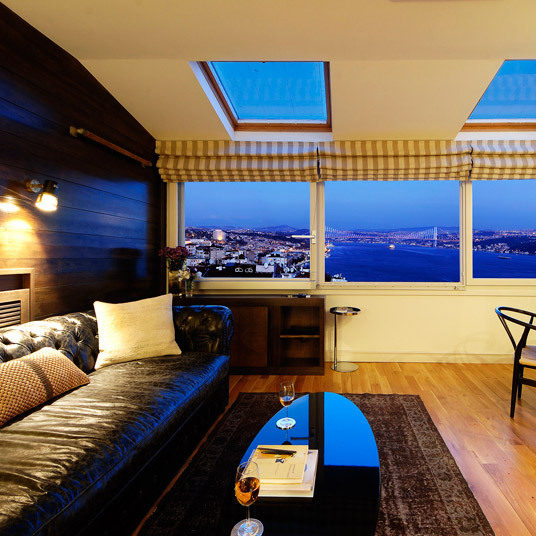 Seven suites, last we checked, is not a lot, and at that size it’s easy enough to think of this place as your own private residence — your own forty square meters, we should say, with a view of the Bosphorus, an in-room kitchenette, and a bathroom that’d be the envy of many a luxury hotel. Of course, at that size there’s not much in the way of traditional hotel amenities — an Olympic-size pool, needless to say, is out of the question. This is where the concierge comes in. Here they do a bit more than just draw arrows on a poorly folded map of the city — they’ll get you restaurant reservations, book treatments at local spas, and dispense crucial wisdom about when and how to best see Istanbul’s sights.